Our boys may be on the far side of the world but they still managed to spoil us at Christmas. Two separate packages arrived at the boatyard. One son had obviously thought of our essential needs and purchased a hamper of “luxuries” for us to consume over the festive season. 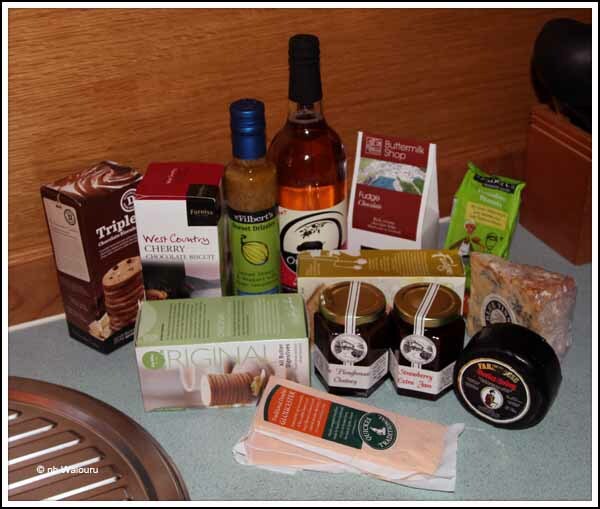 Jan has been having fun sampling the various cheeses. Meanwhile I wanted a “tipple” from the cider bottle. There is plenty left! The other son focussed on our need to communicate and amuse ourselves within the confines of a narrowboat. Jan has taken to the iPad2 like a duck to water. After installing Skype she was making calls back to Australia. 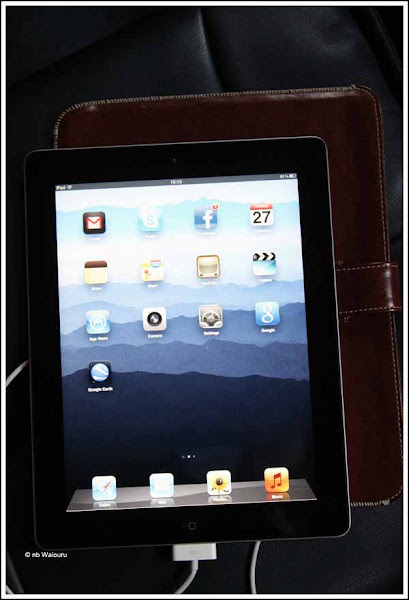 She has also started using it for web browsing and as an e-Reader. As far as we are concerned the value of any gift is secondary to the thought behind it. So we count ourselves particularly fortunate to have such thoughtful sons. The day was spent in Newbury. First it was a visit to B&Q where I had intended to purchase some flexible conduit to use in Waiouru. I want three separate runs for the external mobile phone aerial, the TV dome and the solar panels. There are no firm plans for the dome and panels but I thought it would be prudent to install the conduit and '”draw cables” before the spray insulation was reapplied and the ceiling installed. Well they had no conduit in stock! Moving along; I took Jan around to look at bathroom taps. No decisions were made there either! 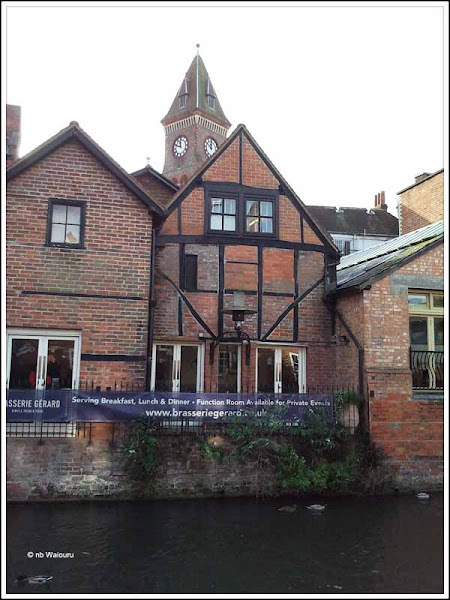 We then walked the towpath into the town centre. I keep forgetting to take photo’s so today I deliberately took this one of the town from the towpath using the mobile phone. I think I’ll have to pin a photo reminder note on my shirt. Our first stop was WH Smith so Jan could purchase her weekly magazines and then we went to the Thursday farmers market. Jan examined all the butcher’s wares before eventually deciding on the Gammon roast (again!). She has worked out how to make it last four meals and as it’s something we’ve not seen (or eaten) prior to arriving in the UK we haven’t become tired of the novelty. Next we went to the mall where I tried on work boots. I’m looking for a pair to wear when working on Waiouru. I don’t want to use my good tramping boots as they will quickly get knocked about. Unfortunately I didn’t find any I liked so we moved to Jan’s favourite shop where I managed to procure four pairs of reading glasses at 99p each. Jan did question whether pink frames were really me? Hell; I’ll wear that pair on the boat when there are only the two of us. I lose them fast enough for it to not matter! The mem sahib then decided to treat us to lunch. Cheapest spot is Subway where she has previously worked out the best (cheapest) option. I parked myself at a vacant table whilst she scurried off to do the purchasing. Five minutes later she was back with the lunch but scowling and grumbling. Now she has bought the same order on two previous occasions so she knows the exact price (£8.46). This time the till operator told her £15. “I don’t think so!” says my girl. The operator then said “£10!” So my girl asks “Have the prices gone up?” The till operator ignores her so she pays up. Hence the grumbling. Anyway, I do things the old fashioned way and tote up the cost using my pen and the back of the receipt…. £8.46. More scowling and grumbling. Probably not helped by me suggesting she should have asked the operator “Are we playing pick a number?” Subway Newbury just lost two customers! I suspect in future we will either be eating deep fried rat dipped in 11 secret herbs and spices; or dining in one of those Scottish restaurant! To cheer up mem sahib I agreed to purchase her a mink robe. Of course no one else will see her wearing it as she has informed me she won’t wear much underneath it. A good post Christmas bargain, discounted down to £12. The final stop was Sainsbury’s where we filled her new shopping trolley (an internet bargain at £14.99) with fruit and veg before walking to the railways station. Obviously these days I’m more of a SNAG (sensitive new age guy) as I towed her new pink and black striped trolley all the way to the station. We missed the train by three minutes so spent 57 minutes sitting on a steel plate in the wind waiting for the next service. About sums up the day really! Our second day of geocaching and we didn’t find either cache. The first clue was “the cattle crossing”. 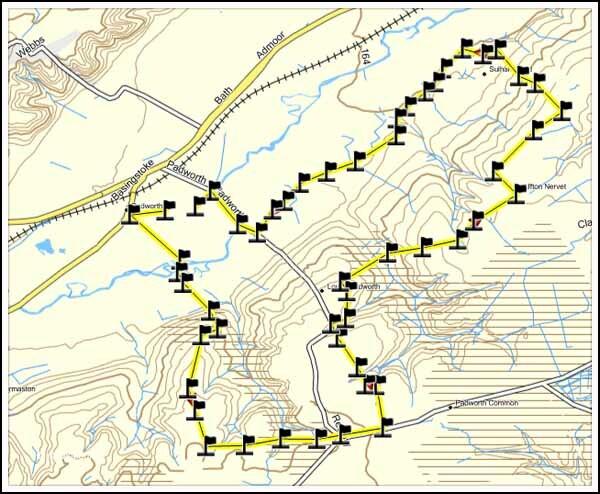 Well we found the crossing without much difficulty, but could we find the geocache……. The hell we could! I practically grovelled around in the mud underneath it whilst Jan picked over every stone and blade of grass. 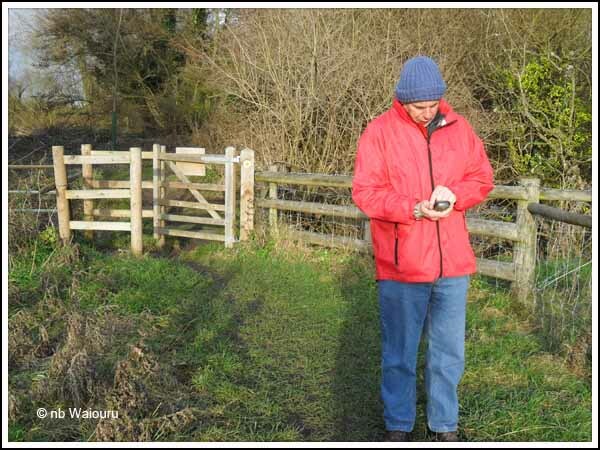 Who is this elderly man wearing a red jacket and reading a gps? The second location was a footbridge across a small creek and the clue was “mid span don’t drop it!” I lay on my stomach in the middle of the bridge and felt everywhere. I even nervously poked my fingers into dark wet crevasses and the ends of hollow pipes before remembering there are no deadly Funnelweb or Redback spiders in the UK. Another location we are going to need to search again a some future date. 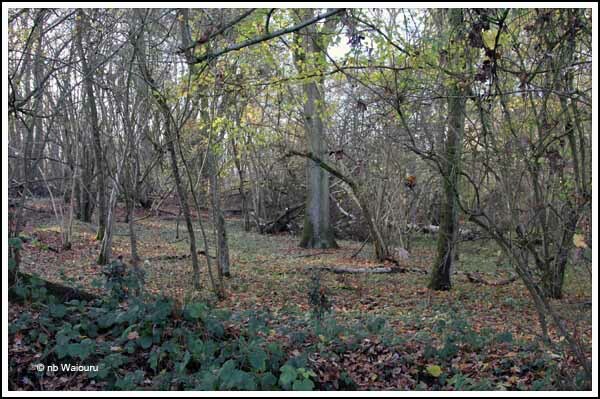 On the way back to Ufton Jan noticed this scene. 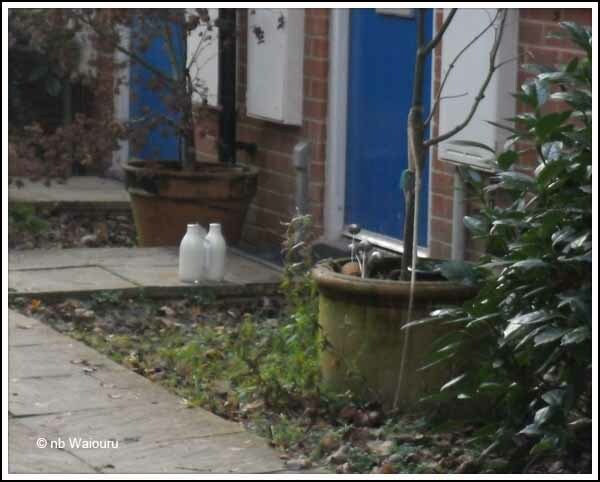 Glass milk bottles….. and delivered to the door! When was the last time we saw milk in a bottle… let alone delivered? It would have been 1979 when living in Trentham, NZ. Well that turned the clock back for us! A very mild day encouraged us to get out and enjoy some fresh air. Obviously we weren’t the only people with that idea as the towpath and woods were full of families out enjoying the day. When I first purchased the Garmin Oregon gps I noticed the geocache icon and wondered what it was. A quick search on Google resolved that issue but I never made any serious attempt to find a geocache in Australia as they seemed few and far between. Last night I went back to the geocaching website and to my surprise discovered there were numerous caches in our area. After transferring some to the Garmin Jan and I set off to see if we could actually find a cache. Our first effort was at the local park and I’d specifically selected it because I (correctly) thought it would be reasonably easy to find. This one was nice and big. 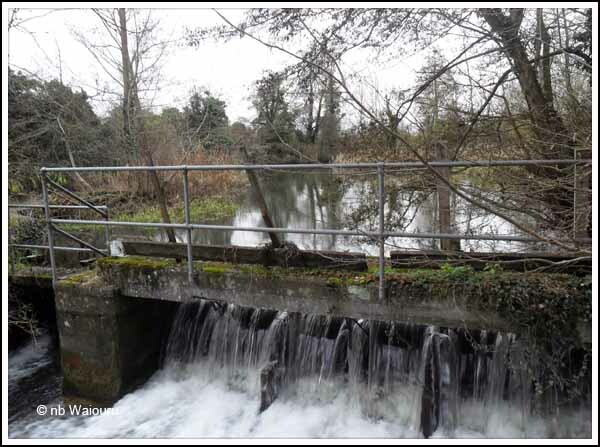 Unfortunately water had been able to enter it and as a consequence the log book was “soggy”. However I was able to enter our details and return it. I’ll mention to problem of the water on the website. The second geocache was down by the salmon race. This was a micro geocache. I’d never seen a micro geocache but assumed we would be looking for something very small. I eventually found it, discovering it was about the same size as a 35mm film container (for those of you old enough to remember 35mm film). Unfortunately I didn’t know how to open it and therefore left it rather than cause any damage. Our third geocache was much closer to the boat and adjacent to the towpath. 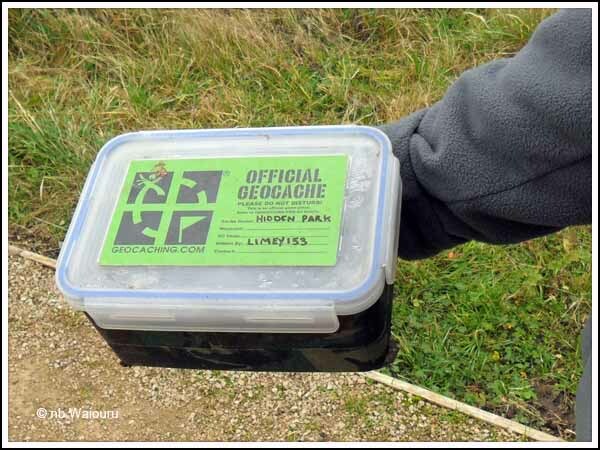 The size of the geocache wasn’t mentioned on the website but after some searching I eventually found this “easy” geocache. The damned thing was the shape of a small rock! Jan was able to pry the plastic cap off the bottom which enabled me to enter our details onto the tiny piece of paper inside. 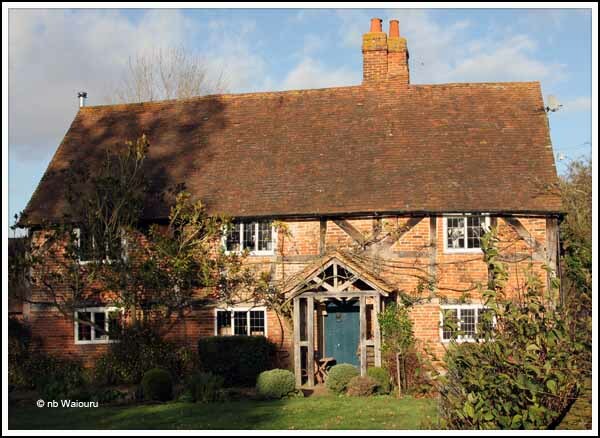 Well satisfied we returned to Ufton for lunch. There are two further geocaches located within easy walking distance and I have the feeling we will be doing more of this geocaching! 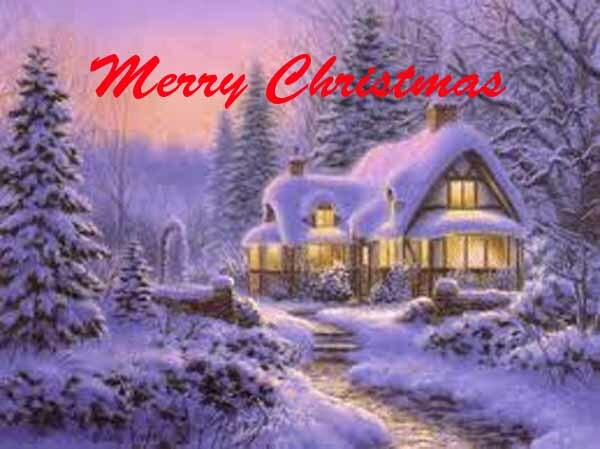 A Merry Christmas to our blog readers! For the first time in more years we care to remember we’re experiencing different Christmas weather. Usually, it’s a cold buffet or a BBQ lunch accompanied by large quantities of chilled drinks; all consumed under a shady tree or inside with air conditioner running. Ordinarily Jan would be finding locations in the lounge to strategically place the cards but being so far from family and having no address means few cards this year. Sending cards overseas can be quite expensive so we aren’t that fussed if the volume of cards has significantly reduced. Very recently Jan discovered how to send electronic cards to our extended family using e-cards from 123 Greetings. Next year we will realise our dream of completing Waiouru and then head off on our journey around the inlands waterways of England and Wales. In the meantime…….. Have a Merry Christmas and a Happy New Year. I’ve made my first visit to Screwfix. It’s something I have been eagerly anticipating after looking at their website. I envisaged an experience similar to my trips to Homebase and B&Q. I should mention for any Australian or New Zealand readers these business are similar to Bunnings, Mitre 10 or Placemakers. I wanted to spend time walking the isles, sniffing the atmosphere and examining the goods on display. Using my own inbuilt sense of direction I started walking and eventually came upon a medium size industrial style building with a small Screwfix sign. I was slightly concerned about the size of the premises. It simply didn’t look big enough! My next shock was walking through the entrance. No checkout counters and no isles to browse. Instead there was a row of small booths containing a catalogue, pen and order form. The practice is you select the items you want from the catalogue, write the stock number on the order form with the supplied pen and then take your order to the counter. The order is entered into the computer and you pay the bill. You then take the invoice and receipt to another counter and wait for your purchases to be collected by a staff member and delivered to the counter. I guess it cuts down on shoplifting ! However I felt deprived of my anticipated pleasure in browsing the isles. I’m also somewhat disconcerted by not being able to “handle the merchandise” before deciding to purchase! By again following my sense of direction I found the canal and B&Q. This was more the “fix” I’d been looking for. Walking the isles; examining washing hoists, telescopic poles, bathroom fittings and electrical components. So soothing………… <sigh>. I now have a couple of ideas which may yet germinate into something useful. After completing the blackwater tank Dennis moved on to the gas locker in the cockpit. The locker had been designed to take 6kg calor gas bottles. We’d been advised 6kg was a better size and weight to manage on the boat. It seemed a very sensible suggestion until we discovered there was only £3 difference in the refill price between 6 and 13kg. Suddenly our future gas bill had doubled. I had asked if it would be possible to modify the existing gas locker to take a 13kg bottle and was informed it wasn’t practical. We had therefore resigned ourselves to the increase in the cost of gas. The inspection of the gas locker also revealed it wasn’t compliant with the gas regulations. 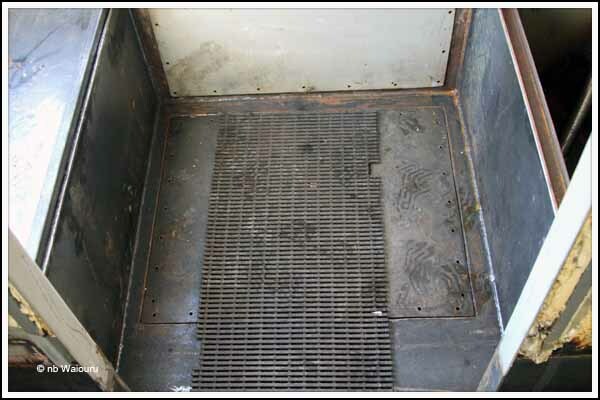 Whilst it had a gas drain in the base of the locker it also had side opening doors. The regulations require the bottle be secured in a vessel sealed to the height of the gas bottle regulator. The solution was to remove the doors and replace them with a panel. The top would then be cut out of the locker to allow access for bottle replacement. Well it didn’t quite work out that way. Dennis did some serious thinking during the night and modified a suggestion of mine. 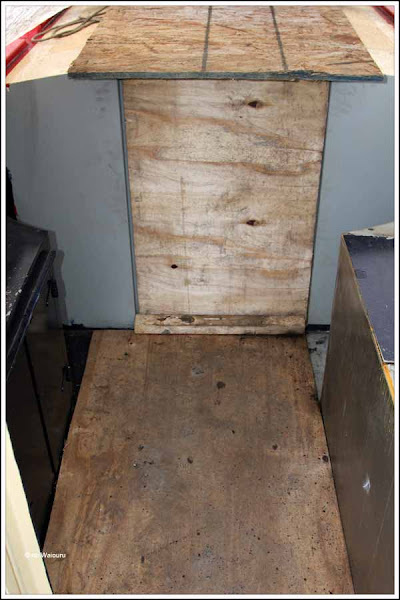 One of the original front locker doors has been recycled as a hatch door. The really good news is there is sufficient height in the original locker to allow a 13kg bottle to be inserted through the hatch. Even better; there is sufficient room for three bottles. I estimate being able to use 13kg bottles is likely to save us approximately £1500 over the next five years. 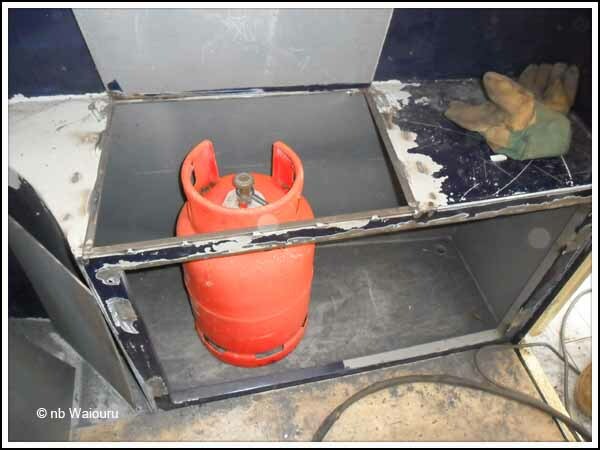 Dennis is welding the new front panel on the locker as I write this post. 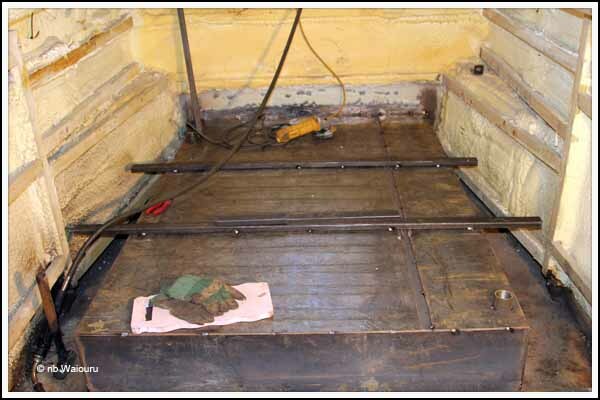 He has already welded in the gas bottle securing chains and the structural “lip” around the new hatch. A very productive day! 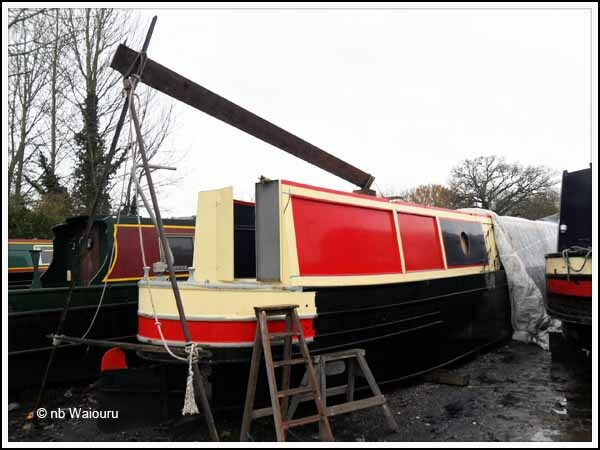 The weather was mild and dry which enabled the boatyard staff to get some blacking onto the two boats scheduled to go back into the water tomorrow. There was a suggestion of rain in the air so I decided to lend them a hand. It was also an opportunity for me to see how it was done. Dennis arrived with all the steel for the blackwater tank and we promptly transferred it all into the back cabin. He has already tacked and plumbed the sides. The rinse and suction pipes have also been fabricated. Another view of the tank walls from inside the boat. I made a temporary cover for the engine hole along with a temporary cover for the back doors and hatch in a further effort to ensure the interior dries out. Finally I made the bracket for the external mobile phone aerial using some left over steel. Meanwhile Jan waited for Mr Tesco to deliver our Christmas supplies. Another very big order! I think we must now have about 30 litres of milk and 25kg of flour. The freezer is already full of meat and fish so we shouldn’t run short of food during the next fortnight. 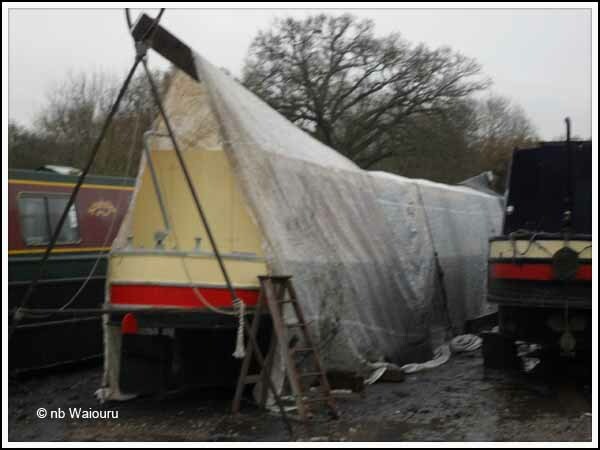 You may recall in an earlier post how a storm had blown the inflatable paint shed off the boat being repainted and the shed had suffered considerable damage as a result. Today the yard staff removed the collapsed shed off the boat and examined it. They were able to salvage one of the three sections. Then, by taking the fourth section which had been covering the stern of Waiouru; they had enough length to inflate the shed back over the boat. 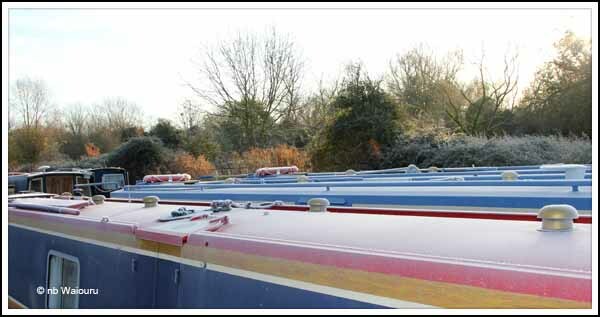 It will be a little tight but they should be able to continue with the painting of the boat under cover. Of course this left Waiouru without any cover over the rear half. I’d already become concerned about water entering Waiouru through the porthole openings so I decided to construct my own shelter from the “odds and ends” lying around the boatyard. Using three old boat poles and some lashings I made a shears legs. Then I used a boat plank as a ridge pole. This was all lashed to the boat. I needed the shears legs to be higher than the rear of the boat to give some head room. I also took the opportunity to examine the smaller of the recessed red panels. It’s been the first time I’ve been able to get a good look at them since discovering a sheet of steel had been used to cover the rear portholes. As I anticipated; it appears the panels have been glued rather than welded into the recess. I will need to discuss what we can do about the situation with Andy. 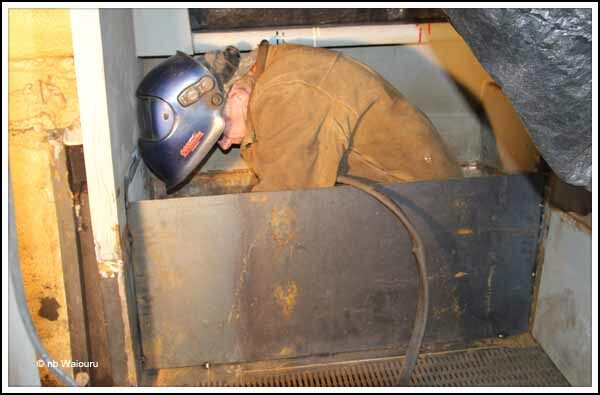 It might be harder to remove the panels than weld them in place and cut new porthole openings. I’ve now pulled the tarp over Waiouru and secured it with whatever heavy objects I can find. This will provide a sheltered area for both Dennis and I when working in the cockpit and will also assist in drying out the boat. Of course it will all have to come off in the New Year for the grit blasting. Dennis has completed all the steelwork in the cratch. It’s been a significant project due to all the additional work needed to rectify the unauthorised modifications made by our first builder. It was obviously much easier and quicker to “chop out” the original structure with a gas torch and replace it with a plain foredeck. As a result Dennis has needed to work carefully to ensure all the original steelwork is correctly reinstated. It’s pleasing to see the area is now back to the condition it was when first constructed by Tyler-Wilson. I now have the tasking of cleaning the area and applying primer. 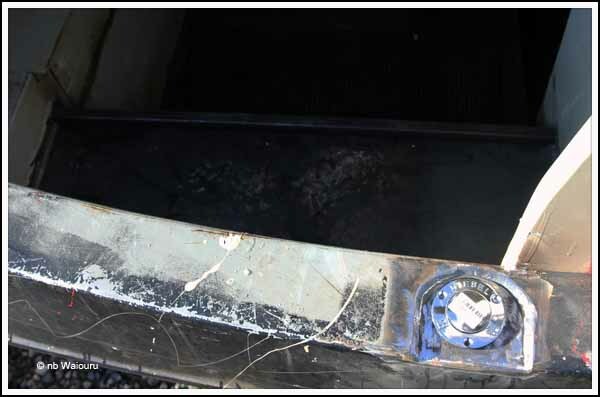 The two lengths of one inch box steel on top of the diesel tank are there to provide some rigidity and secure the timber lid/seat. You will note the front box section runs the full length of the tank and acts as a barrier to any water that may fall on the lid. 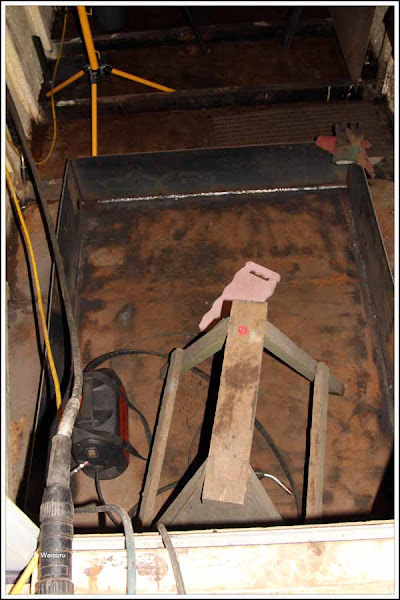 The second box section has a gap at the bulkhead end (lower red arrow) allowing any water to escape to the side of the boat. 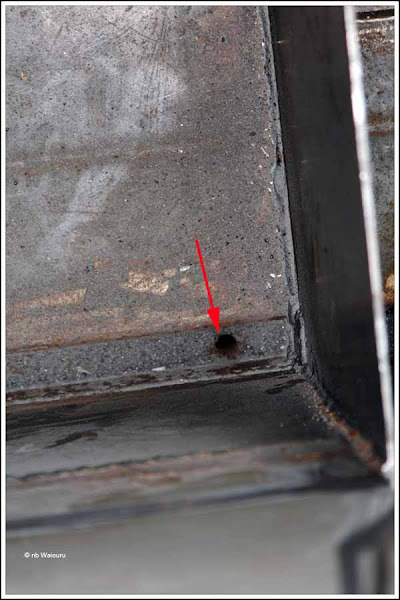 There is a small hole (top arrow) through the hull where the water will discharge overboard. Our plan is to have a cratch cover so (hopefully) the entire area will always be dry. You may also have noticed the large diameter filler pipe running from the underside of the gunwale to the top of the tank. 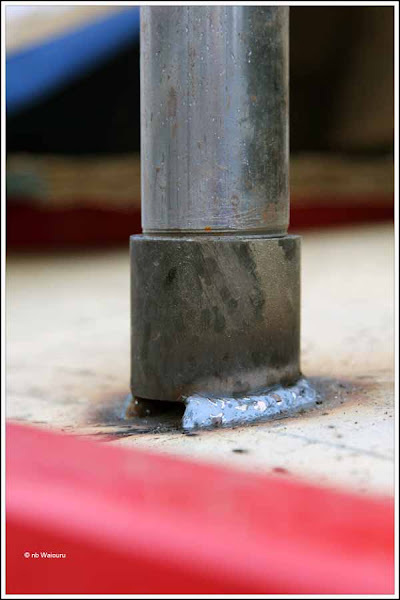 I suggested to Dennis he could use a much smaller diameter pipe, however he preferred to use the larger pipe as it made it easier to weld the “blind side” of the joint. Dennis also mentioned the pipe will possibly hold an additional ½ gallon of diesel. Next week Dennis starts on the blackwater tank. 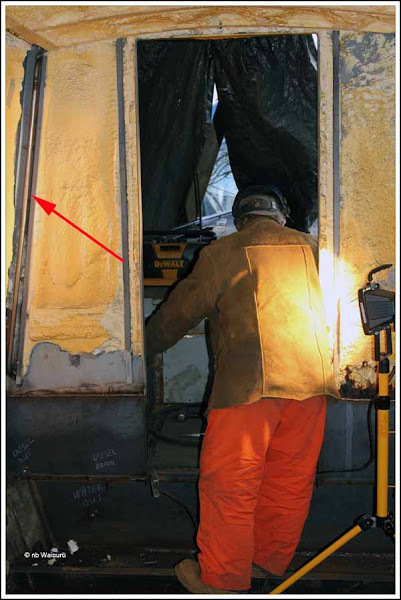 However, before he can start I need to remove the spray foam insulation from the lower portion of the end bulkhead between the back cabin and the engine compartment. I also need to clean the area to give Dennis a good “run at the task”. Woke this morning to frost on the windows and a grey old day, then it started to rain! However by 10.00am the sun was out and we had a blue sky. 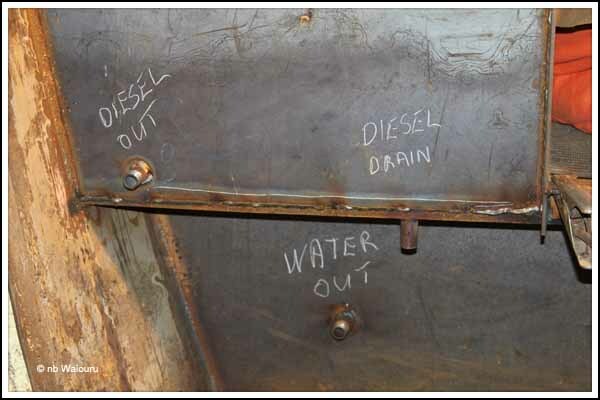 Today was our last chance to see the inside of the cratch diesel tank. 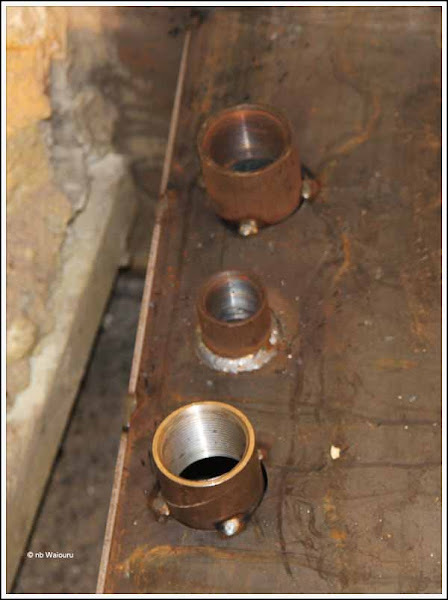 The hole for the diesel inlet has been created in the gunwale [B]. 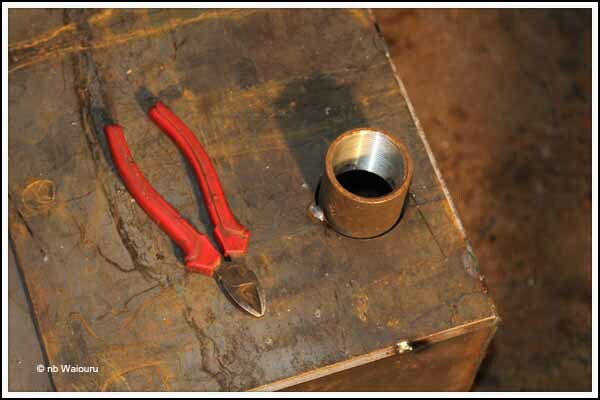 The plate [A] will be welded to the underside of the gunwale filler point to create a recess. Dennis has also welded a piece of “L” section across the top of the tank to provide some rigidity to the side of the tank. The tank is full of debris from the welding and grinding. I’ve subsequently removed all of it with the industrial vacuum cleaner. The top and filler point should be completed tomorrow. Meanwhile Father Christmas came and Jan finally has some winter footwear. We’ve been looking for something suitable during the last three months and today we came across these yesterday whilst in a Newbury department store. Jan and I have different shopping techniques. Jan will usually look at the price before having a good look at the suitability and practicality of the item. Whereas I do the reverse. I found the boots and thought they were ideal for the canal environment. Then I checked the price….. £149.99. I didn’t like it but; given the quality of the product; that was about what I had expected, . After giving them to Jan to try on she checked the price and found the discount label………£39.99 They have a good tread and I like the rubberised waterproof lower half. 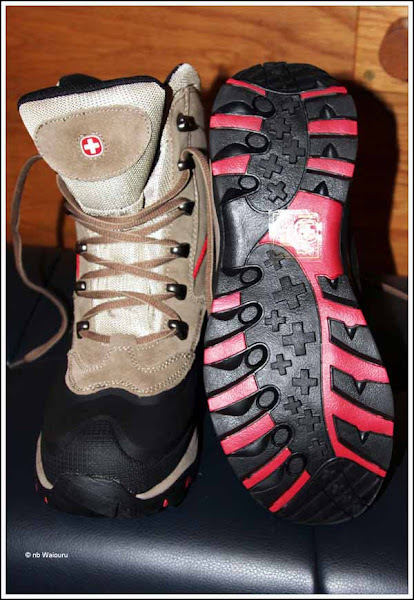 The boots are also lined with Thinsulate. Hopefully Jan now won’t suffer from cold and wet feet! Moses it was cold and wet this morning. I played “possum” this morning pretending I was asleep which resulted in Jan arising and turning on the heater to warm Ufton. Once I heard the kettle’s whistle I sprang from under the duvet and into my thermal underwear yawning and stretching in a pretence I’d only just woken. Somehow I don’t think she was fooled! Peering out the window I could see a large crane and two semi’s articulated lorries. 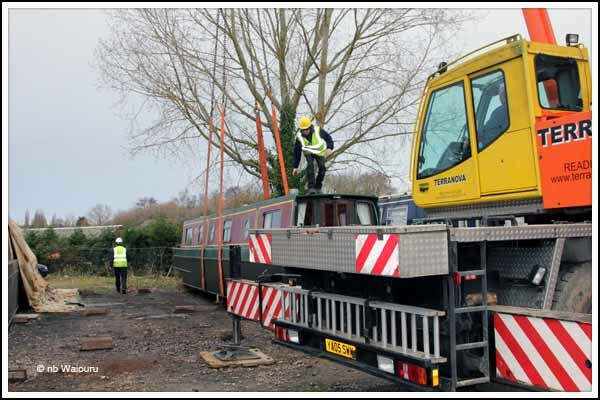 Today was boat moving day at Aldermaston Wharf. Eight lifts altogether. Two of them onto the semi’s lorries for distance waters. Waiouru now has new neighbours. A couple of them only require their bottom’s being blacked whilst the remainder are here for more serious work. The bad news is the overnight storm blew the inflatable tent off the boat being painted and seriously ripped it. I’ll have to discuss any consequential implications for the completion of Waiouru with Andy this Friday. Luck Dennis is height challenged. It would be impossible for me to fit into the diesel tank! The sidewall is only tacked in place to align it because Dennis needs to blank off the drainage channel. By blanking off the channel it will create a small linear sump at the low end of the diesel tank. You can get more of an idea of the design from inside the boat. 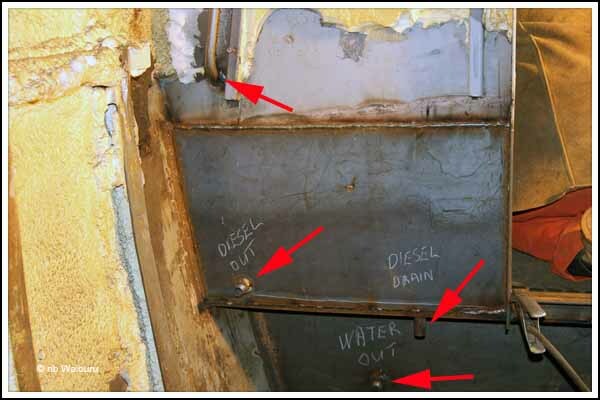 The top left arrow is pointing to the diesel tank breather pipe outlet. The bottom left arrow points to the diesel outlet point. It’s about one inch above the base of the tank. 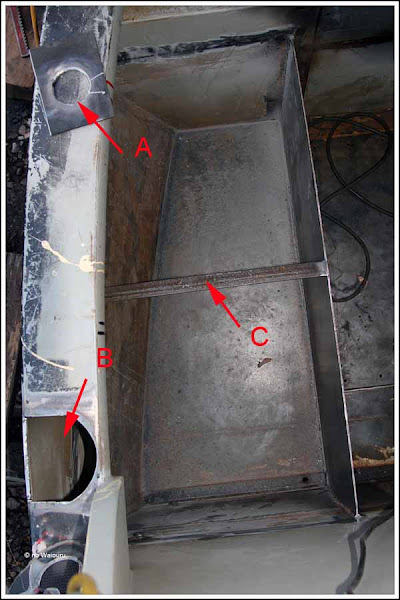 To the right is the diesel drainage point which is located in the base of the drainage channel. This will have a stopcock and an outlet hose. This will enable us to drain off any sediment or water from the base of the tank. At the bottom of the photo is the water tank outlet point. 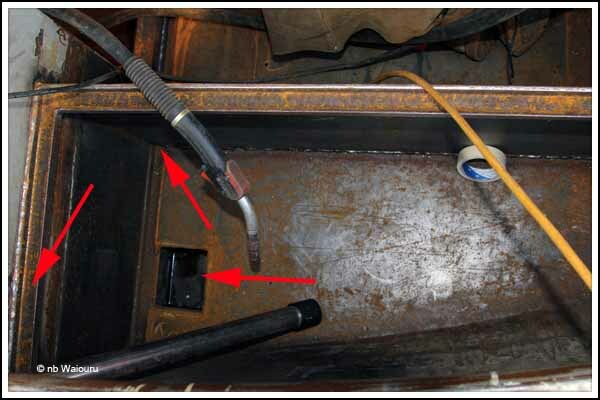 OK…… You’re probably asking why the outlet point is halfway up the tank? It’s been placed here to make it easier to connect to the outlet point from inside the boat. On the other side of the outlet point the pipe turns 90 degrees and terminates about one inch above the base of the tank. And finally, you can see the diesel tank breather pipe running up the channel I created by scraping the spray foam insulation off the bulkhead. Both breather pipes will be covered with foam insulation when Waiouru is resprayed. The bow storage locker has now been fabricated. 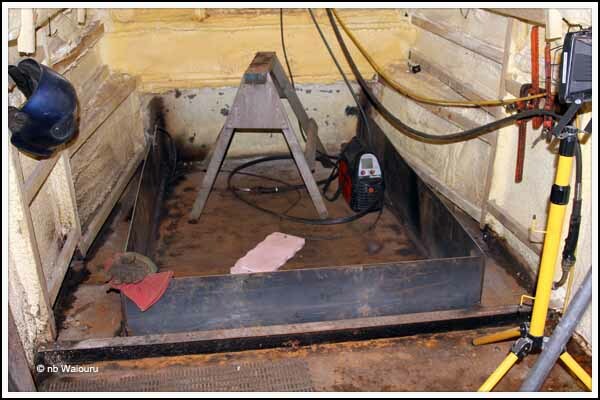 As the base of the locker is below the waterline you can see a sump (right arrow) where the bilge pump will go. 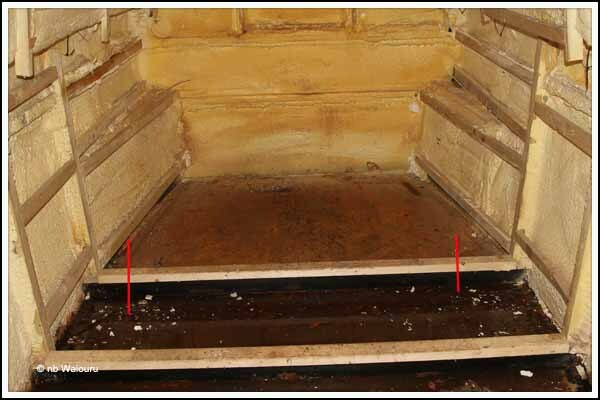 The middle arrow points to the drainage opening between the foredeck and the base of the locker. 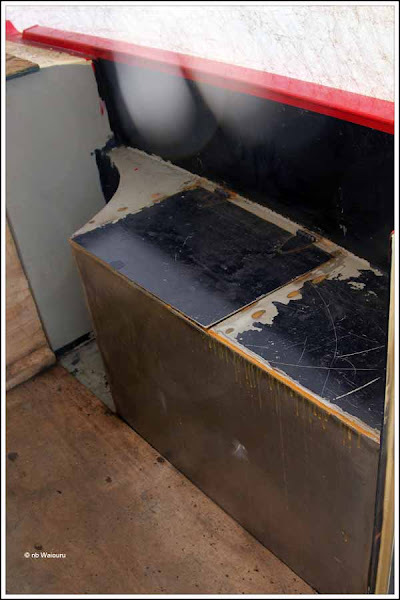 Any water that gets onto the foredeck will drain through the opening and into the sump. There is a “U” channel (left arrow) around the top lip of the locker. This will collect and water that falls onto the locker lid. As the lid is above the waterline this water is discharged overboard via a drainage hole in the bottom left corner of the photo. Life’s so bright…. Gotta wear shades! Well Ufton really got bashed about by strong winds last night. I’m please I’d found some old fenders in the long grass and placed them between the boats. Just to make things more interesting the shore-power failed at 8.00pm. Left in the dark with no heating we decided to go to bed. Until I was able to actually carefully inspect Waiouru I hadn’t realised there was a steel floor joist 4’6” from the rear bulkhead. The planned length of the back cabin is 6’3”. On 10 June I was able to have a quick look at the area and the steel tank Ben Harp intended to install. His tank was only 4’6” long which would have resulted in the back cabin having split floor levels. It would also reduce the tank storage capacity. 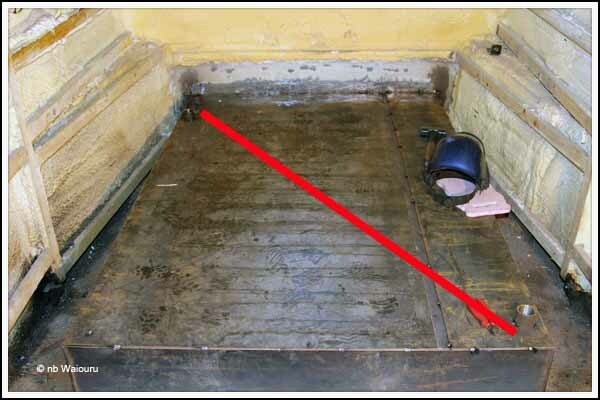 After discussing the situation with Andy, we have decided to remove the steel joist between the two red lines drawn on the photo below. We are not going to remove the entire joist as I wanted to leave a “heel” to retain some structural strength in this area. However the baseplate is 20mm thick so there shouldn’t be an issue. My idea was a separate fabricated tank would be manufactured and installed. However Dennis has suggested we use the 20mm baseplate as the floor of the tank. The contents of the tank are going to have their work cut out trying to eat their way through 20mm of steel. 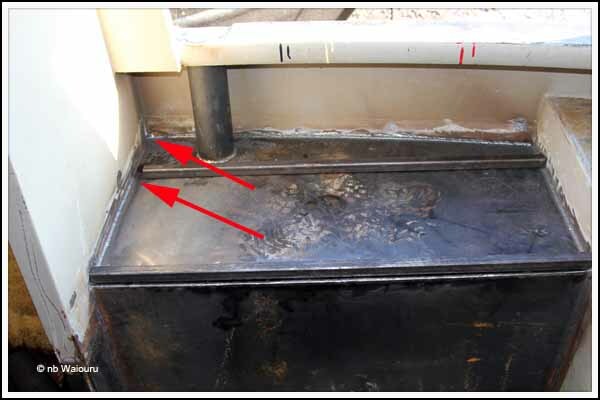 Moreover, most corrosion will occur in the tank air void so it will be the upper parts of the sides and the top plate most susceptible to corrosion. Andy and I have agreed the tank should remain 12 inches high. This allows for the build-up of “crud” on the bottom of the tank. Notwithstanding this I’m also looking at the design of the flush pipe to ensure the base of the tank gets well rinsed. The tank dimensions will be approximately 6x5x1 feet giving a capacity of 186 gallons or 850 litres. This will provide approximately 60 days storage. But it’s unlikely we would want to fill the tank as it would probably affect the trim carrying an additional 8 tonnes of ballast. However it’s good to know we could probably last two months should we every get stranded or frozen in. It was a crisp but clear morning so I took the opportunity to go for another walk. However I wanted to check on my two hour wonder cratch cover before departing. 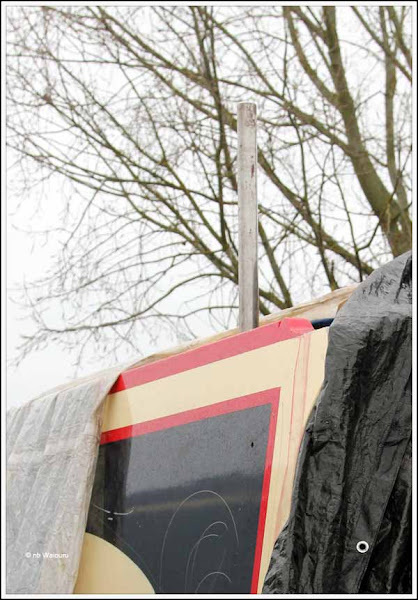 Not your usual cratch cover but it will hopefully keep out most of the rain whilst Waiouru is made watertight. 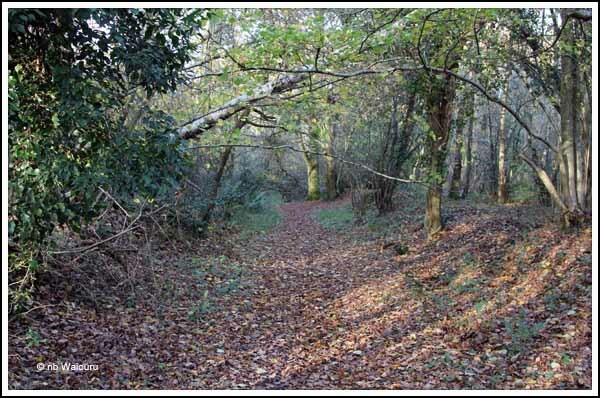 Back to Ufton and on with my boots. 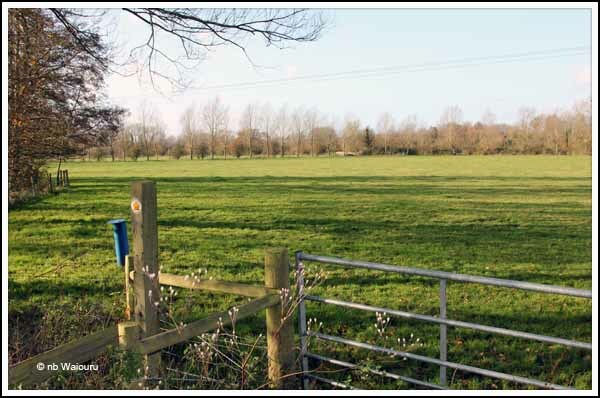 I headed across the fields using the public footpath. I’m still trying to get used to the idea that it is permissible to walk across a farmer’s land! The blue pipe in the foreground to the immediate left of the fence post caught my attention. After examining it I came to the conclusion is is some type of monitoring borehole. There are so many well used trails it would be hard to become geographically embarrassed. Now the majority of the leaves have fallen it much easier to see the terrain. I saw a pheasant and was able to follow him for about 500 yards as he ran along in front of me. Although he paused on a number of occasions he never actually allowed me to get within “dinner” distance! The footpath terminated on a narrow country lane and around the next corner I came upon this attractive house. I’m still fascinated by these types of building which don’t appear to have a straight line or right-angle in them. 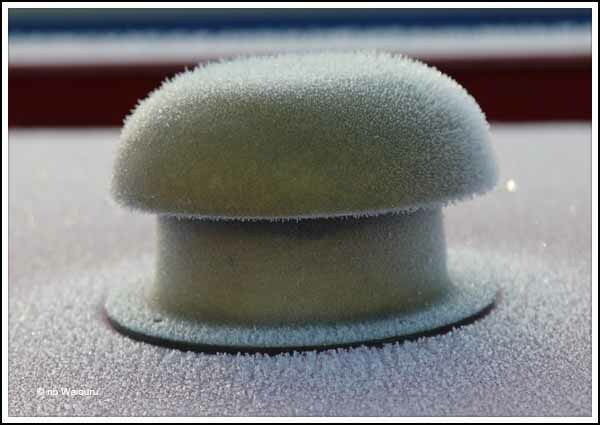 I donned my polar-fleece jacket, Thinsulate gloves and beanie before venturing out of Ufton to look around. 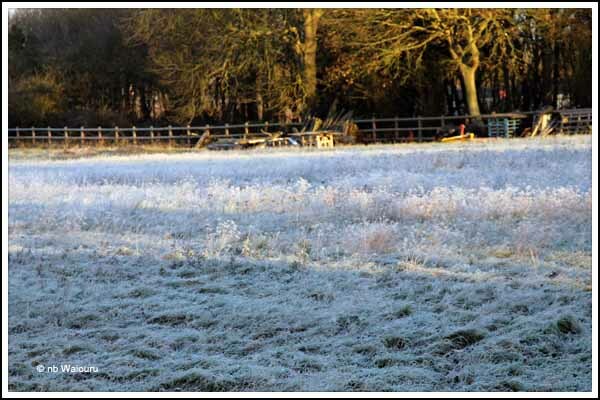 The field beside the towpath looked white. 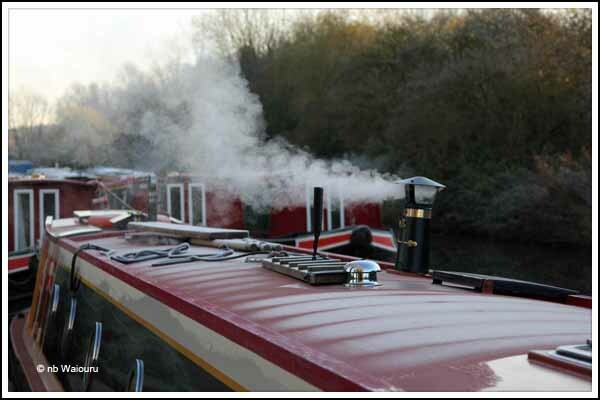 But to my surprise Kevin from nb Meand’er, (moored in front of us) was out and only wearing a T-shirt <brrrrrr>! Behind us Paul had his wood stove in operation. Today I set myself a target of constructing a cratch cover for Waiouru. The target was achieved but it was too dark for a photo…… Tomorrow!